I had this wine from my cellar, as well as at a tasting in Zurich in February of 2015. It is one of the handful of 2003s I bought from the Right Bank of Bordeaux in this vintage. 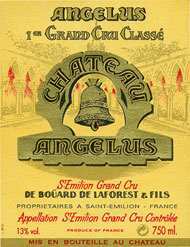 Angelus really nailed the vintage, and has produced a fully mature wine that’s truly strutting its stuff. Dense, bluish/purple, it offers gorgeous notes of espresso roast, blackberry and blueberry liqueur, acacia flowers and a touch of chocolate. It is full-bodied, opulent and seems close to full maturity, as it is evolving quickly. The wine is full-bodied, rich and should be drunk over the next decade. Drink 2015-2025. One of the great successes in St. Emilion in 2003, this wine has actually gotten better over the last eleven years. Pushing perfection, this blend of 57% Cabernet Franc (the highest ever at Angelus) and 43% Merlot boasts a dense purple color as well as a sublime set of aromatics, including forest floor, blue, red and black fruits, charcoal and hints of licorice and wood spice. Long, opulent, voluptuously textured and incredibly youthful and fresh, this full-bodied, tour de force in winemaking is an absolute legend in the making. It is an incredible accomplishment for a Right Bank 2003. Kudos to Hubert de Bouard for his vision as well as his perfectionist personality. This beauty should age for 5-10 more years. Drink 2014-2024. Beautiful aromas of ripe blackberry and raspberry aromas follow through to a full-bodied palate, with silky tannins and a long, long finish. Layered and delicious. Gorgeous. Best after 2010. 6,500 cases made. Deep ruby-red. Very ripe yet fresh on the nose: cherry, raspberry, graphite, chocolate, minerals. Lush, velvety and sweet, with unusual vivacity for a 2003 from the right bank thanks to the 50% cabernet franc component. Really coats the mouth with flavors of black raspberry, currant and chocolate. Not yet hugely complex, but the wine's freshness, ripe tannins and superb persistence suggest that aging will bring greater nuance. Has the stuffing to buffer its chewy tannins. This was bottled in September of 2005. A compelling nose of curry and dark fruits, with rose petal and tobacco undertones. Frankly, a wild nose. Full-bodied and racy, this has fine tannins and a round texture. Fresh herbs, berries, and currants on the palate open up to a fresh finish. Three more years will do this wine good. Pull the cork in 2013.